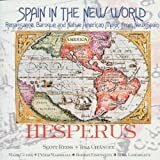 Hesperus is an early music and folk music ensemble. It was founded by Scott Reiss and Tina Chancey in 1979. While they are particularly noted for playing early European music, American folk music and crossovers between them, they often play music from a variety of other traditions.